Re-fight the tactical action of D'Erlon's 1st Corps assault against Picton's Division around La Haye Sainte at the Battle of Waterloo, June 18, 1815. 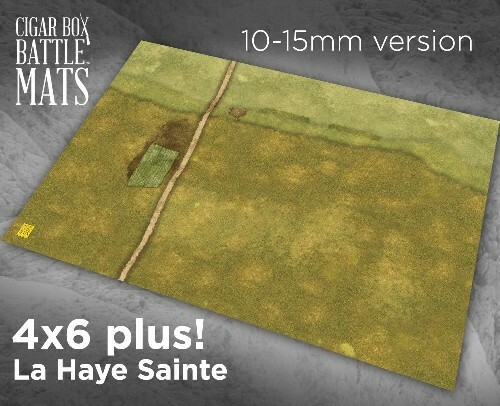 We use this mat for our 15mm tactical games, by adding hills underneath the shaded ridge, a 15mm La Haye Sainte building in the shaded brown area, an orchard, hedges and other pieces of terrain. The road width is approximately 1" wide. This mat also works perfectly as a generic mat for games in just about any period. We have used it for Ancients, War of the Roses, Marlburian, SYW, ACW, Franco-Prussian, and WW1 and World War II. What would you do with this mat? • 6mm, 10mm and 15mm tabletop miniature wargaming!